397-014 Too Early, Too Late, Or Just-in-Time? Software Engineering Education at a Global Level: Who Are the Players? 397-070 Can the Programmers Job Be De-skilled? 397-134 Do Individuals’ Experience and Task Training Really Affect Software Review Performance? M. Lenič, P. Povalej (Slovenia), W. Brunck (Germany), E. Avdičaušević (Slovenia), and R.E. 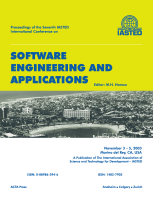 The topics covered in this publication include: software engineering and applications; databases and data mining; software metrics, re-use, and framework techniques; software security, optimization, and standardization; software testing, tools and specifications; object-oriented analysis, systems, and design; software design and development; software requirements and system verification; software architecture and organization; software processes, modeling, and evaluation; using chaos to imply order in software engineering; and mobile computing and multimedia applications.